Mobile machines work in harsh and extreme conditions. Users want pressure switches that provide reliable performance at affordable prices. Learn why mechanical pressure switches are an ideal choice for mobile machine applications. Mobile machines in the construction, agriculture, mining, and material handling sectors, and in the military, work in very challenging environments. These machines are routinely subject to the detrimental effects of dust, water, wind, and extreme temperatures. Vibration, shock, and internal stresses – cavitation, pressure spikes, and changing loads – put a heavy burden on all components. Corrosion from chemicals, fuel, and engine and hydraulic oil are additional problems. Mechanical pressure switches are simple, economical and built for reliability in these conditions. They provide dependable and long-lasting performance in a variety of mobile machine applications. In a mechanical pressure switch, a diaphragm or a piston mechanically transfers the pressure of the medium to a snap action switch (micro switch). Every time the pressure in the fluid reaches a predetermined pressure,the switch point either opens or closes the contact, which controls the specific circuit of the machine. The switch point is preset at the factory or on-site by adjusting a pressure spring. The switch resets when the pressure is no longer within the range of the switch point. The reset, or switch-back, point depends on the hysteresis of the micro switch. Stopping pumps and motors in mobile hydraulics. When the pressure in the fluid reaches a preset value, the switch sends a signal that stops the pump or motor, and prevents damage to the equipment. Evaluating contamination in filters. The switch point is set to the pressure at which the filter becomes clogged. The switch sends a signal to the operator when the filter needs to be changed. Protecting lifting equipment from overload. When the pressure in the lifting cylinder reaches a preset value, the switch is activated to prevent the cylinder from extending further. Emergency brake signal and brake line systems. The increase in system pressure that occurs when engaging the brake triggers the switch, which sends a signal warning to the operator that the brake has been activated. Mechanical pressure switches with galvanized or stainless steel cases work well for most off-road machinery. Different switching functions – normally open (NO), normally closed (NC), or change-over contact (Single Pole, Double Throw, or SPDT) –are used for most simple machine circuits. When selecting the appropriate mechanical pressure switch, consider adjustability of the switch point and switch hysteresis, current and voltage ratings, ingress protection, resistance to vibration and shock, and mounting to the process and electrical connectors. Bottom line, however, is service life and cost. The more switching cycles that are needed for an application will require a more expensive pressure switch due to the higher rating of the switch contact. WIKA offers a complete line of mechanical pressure switches. 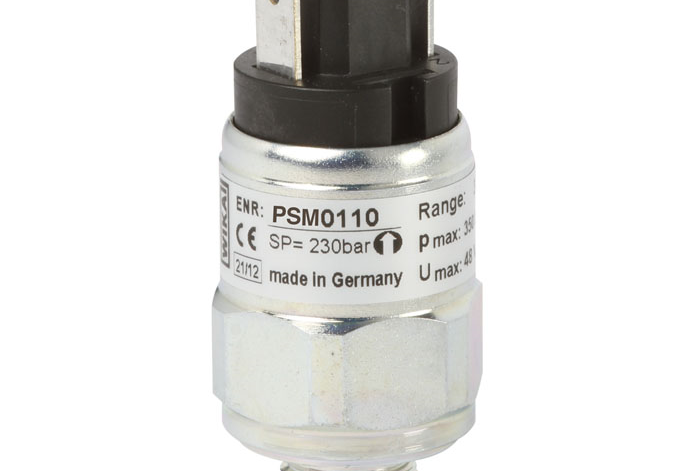 The PSM01, a standard OEM mechanical pressure switch, has an on-site or at-the-factory adjustable switch point, and will provide 1 million switching cycles or more. Other models feature adjustable hysteresis, continuous and precise adjustment of the switch point, high electrical ratings, and are rated to 5 million switching cycles or more. All WIKA’s mechanical pressure switches are compact, work well for a wide range of pressures, and have ingress protection IP67. They are vibration and shock resistant, in accordance with ISO 16750-3. Call WIKA’s experts today to learn more about reliable and low-cost mechanical pressure switches for your mobile machines. This series continues with Mechanical Pressure Switches: Options and Selection Criteria. I have over 25 years of experience working with instrumentation in diverse industrial and process industries. As Market Segment Manager for Mobile Working Machines I work closely with industry leading companies in the development and specification of sensors for next generation machines. In this blog I would like to interact with like-minded professionals and share my knowledge and experience with instrumentation and sensors for off-road machinery.